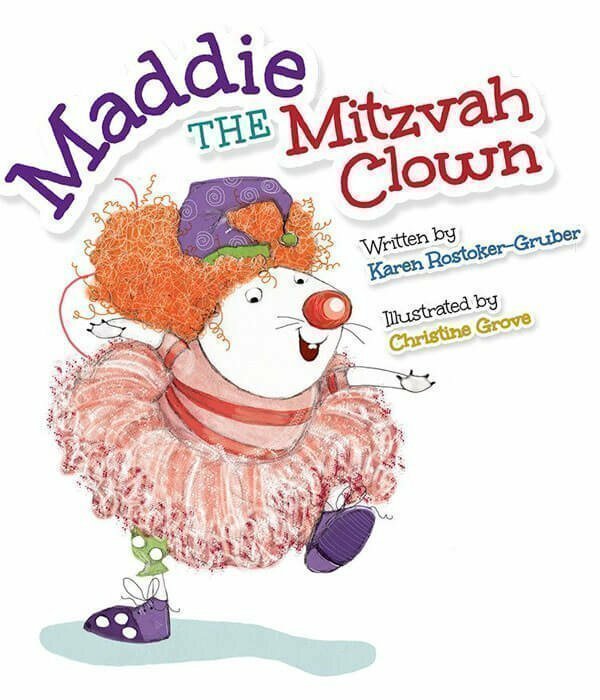 Join Maddie as she discovers her confidence when she decides to become a mitzvah clown in order to bring smiles to the faces of Grandma and Grandma s friends. When Maddie sees Giggles the mitzvah clown perform at her Grandma’s senior home, she decides to join in! She puts on a big red nose and learns how to make balloon animals, sing songs, and most importantly, bring smiles and happiness to Grandma and Grandma’s friends. Along the way, Maddie learns how to overcome her shyness, too, and become a more confident and happy mouse. A cheerful picture book, young readers will enjoy watching how the illustrations begin in black and white, and evolve into full and exuberant color as Maddie gains her confidence. 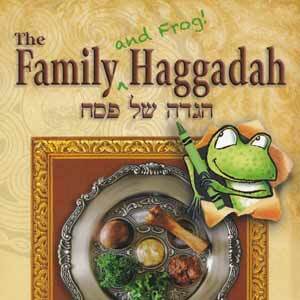 A family note at the end includes discussion starters and a description of the Jewish values found in the tale. Get special content for this book. 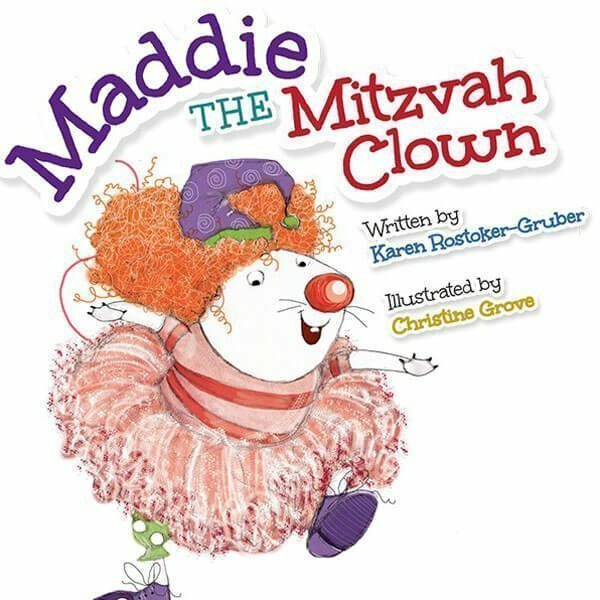 Maddie, a young mouse, loses her shyness when she realizes that she can make others laugh.She sees the joy on Grandma’s friends’ faces as Giggles the Mitzvah Clown performs at their senior home. He includes Maddie as he makes balloon hats, entertains with juggling, songs, and dances, and, most importantly, talks with everyone. She asks: “Can shy mice become mitzvah clowns?” and Giggles assures her that anyone can learn. Initially mostly gray-toned, the paintings with collage elements include more and more bits of color as Giggles introduces Maddie to the tools of the trade (balloons, rainbow wig, red nose), changing to full color as she takes on her new role. 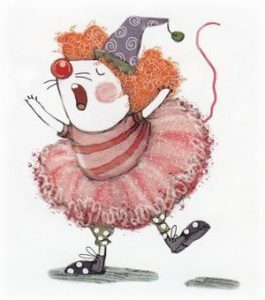 She dons a red wig, pink tutu, and purple, squeaking shoes, names herself “Squeakers,” and begins her visits. Her confidence buoyed by her activities in disguise, she finally makes the biggest change of all: she speaks as Maddie herself to Grandma’s friends. What seems like a didactic story improves along the way as the engaging illustrations involve readers and Maddie’s transformation takes place. In real life, young people (usually teens) can learn to be mitzvah clowns and bring joy to others in this special way. This activity and other ways to do good deeds are described in “A Note to Families,” but no specific references are provided. A different way to give back to the community (and help oneself), this cheery outing should not be confined to its Jewish context. Want to know when my next book is available? Or when Karen and Maria are performing? Please add your email address to our mailing list. We’d love to hear from your class. Here’s how. The official website of children’s book author Karen Rostoker-Gruber.